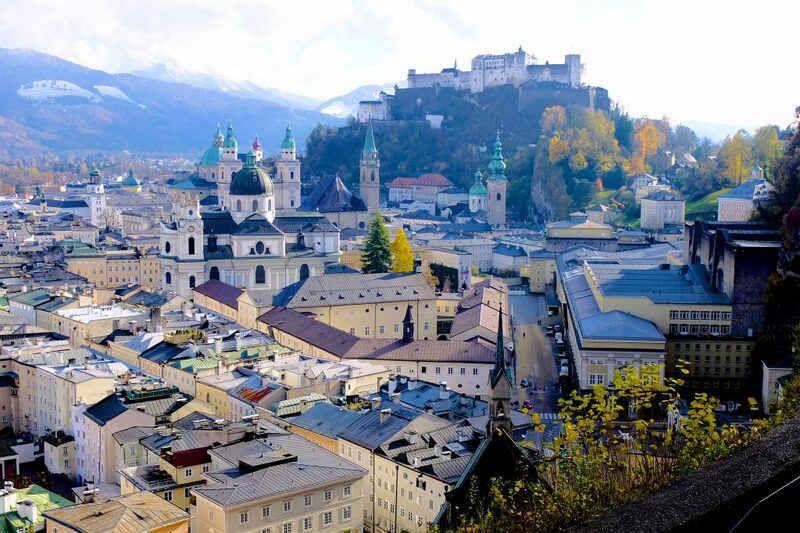 Salzburg, the fourth largest Austrian city, is located at the northern rim of the Alps. While the city itself is mostly flat except for the three “city mountains”, the high alpine mountains dominate the view to the south. Salzburg has a rich cultural heritage, its baroque historic centre is among the best-preserved cities north of the Alps and it is listed as a UNESCO World Heritage Site. And of course, a composer was born here and there is a well-known musical about a family from Salzburg…but we won’t go into detail about this, because people in Salzburg tend to have a somewhat torn relationship to these aspects. To cut a long story short: Salzburg is incredibly beautiful, has one of the highest quality of life ratings globally…and a lot of tourists. View of the old town and the Salzburg fortress. The river Salzach and the old town. 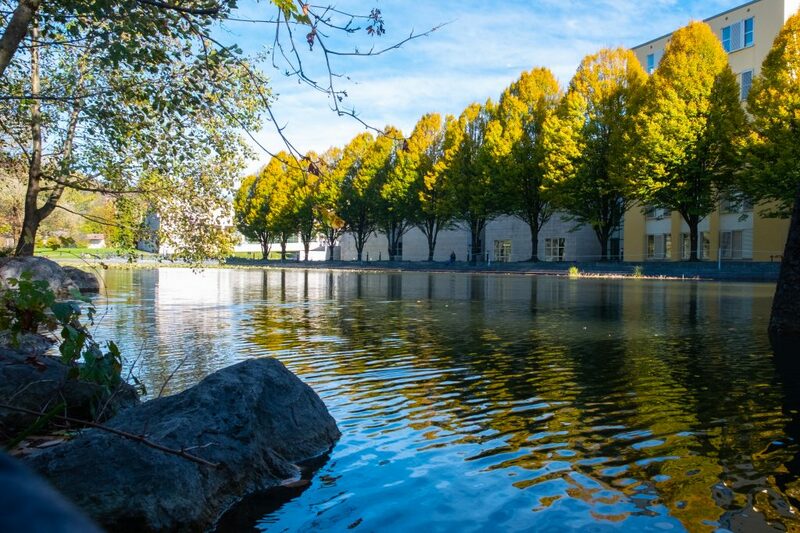 Beyond this, Salzburg has three universities, the largest of which is the Paris-Lodron University of Salzburg (PLUS), which is the one the Department of Psychology and the Doctoral College belong to. The department of psychology, which is also where you will be working most of the time, is located at the Faculty of Natural Sciences, a bit south from the city centre. It is located in a very green part of the city and the terraces, lawns, as well as the botanical garden can serve as a nice alternative to your office when you do not need a computer. Pond at the Faculty of Natural Sciences. Evening at the Faculty of Natural Sciences and view of the Salzburg fortress. 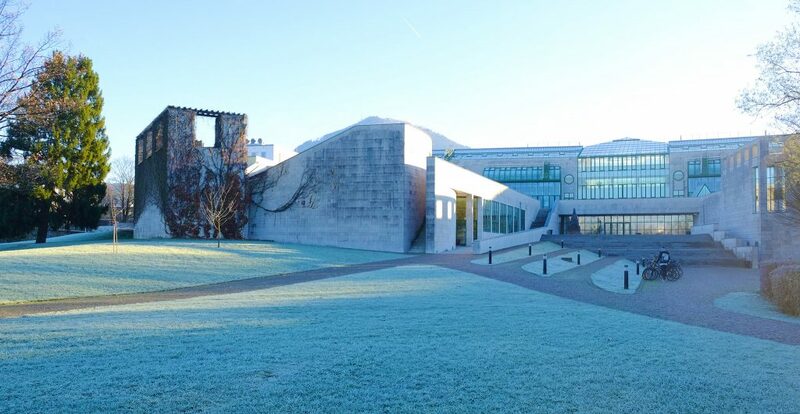 Winter Morning at the Faculty of Natural Sciences. Most people cycle, which is – thanks to the mostly flat topography – often the fastest way to get around, especially if you have to be at the clinic for fMRI or MEG measurements in the morning and at the faculty of natural sciences, where you will have your office, in the afternoon. However, if you prefer to take public transportation, that is also well possible. Unless you want to go to specific places in the mountains, you do not really need a car and even if you have one you probably won’t use it a lot. 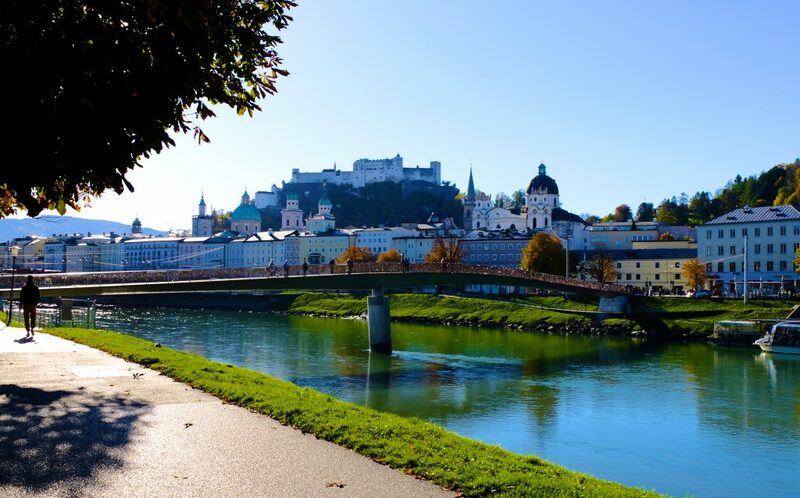 Salzburg has a continental climate meaning it has hot summers (average daily temperature 18.5°C during July/August) as well as cold winters (around 0°C during December-February) with (recently less) snow. Due to its location at the rim of the Alps, Salzburg gets quite a lot of rain, usually more during the summer than during the winter. The official language in Austria is German with the local dialect depending on the region. The language of our programme is English, although we highly recommend to also take language courses at the university’s centre for languages. 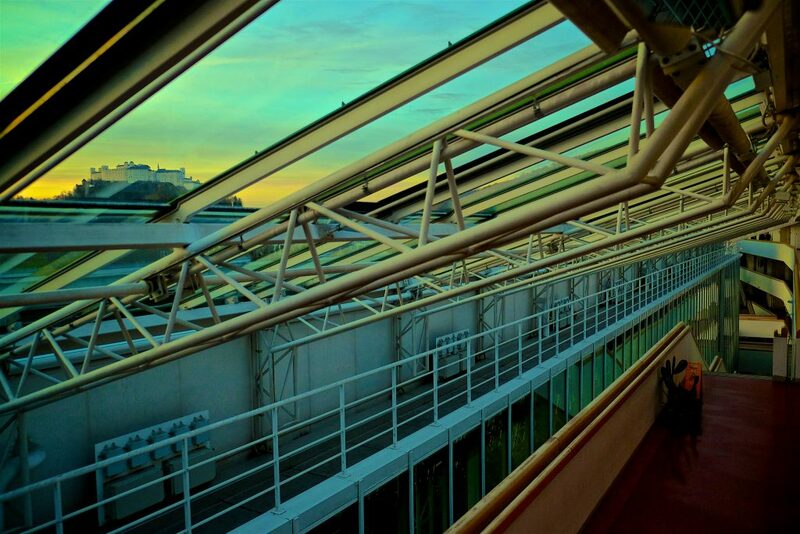 Most people in the city and definitely colleagues and staff at the university speak English – the university is an international place, which is desired and encouraged. We can only perform and be successful if we have sources of relaxation to fill up our resources too. With its beautiful environment, the many alpine lakes around, the mountains at your doorstep, etc. Salzburg offers plenty of these. The university also has its own orchestra, a choir, and the university sports institute (USI) offers any course you can potentially think of. More information on life in Austria, especially if you are coming from a non-EU country, can be found at the OeAD, the Austrian agency for international mobility and cooperation in education, science and research.